Talked about as an old fashioned kitchen tool, our exclusive selection of food mills allow you to mash and strain soft chunks of food more neatly and less strenuously. 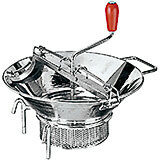 A food mill is a cross between a modern day food processor and a sieve. Simply turn the handle while the angled blade pushes the content through a perforated disk, keeping any pesky fragments like seeds or skin out of your puree/juice safely. Easily strain anything from tomatoes, potatoes, carrots, and other fruits. You can include freshly prepared and more flavorful ingredients in your meal ready to be served. Made from premium quality stainless steel materials, these rotary food mills promise durability. No need to drag out your big food processor, now easily puree fruits and vegetables with our top-of-the-line food mills that come in handy. Also, unlike a food processor, our hand-cranked manual food mills do not incorporate air into the puree, thereby altering its texture and flavor. Great for preparing baby food. 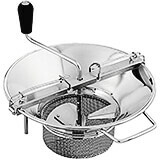 33.25" X 19" X 19"
The Paderno World Cuisine 15 quart mill has an output of approximately 24 pounds per minute and is suitable for a restaurant serving up to 200 guests. The diameter is 15" and the height is 31". 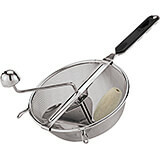 The sieve diameter is 7". A 50 quart stock pot is the best choice for a receptacle. This food mill is made of tinned steel. 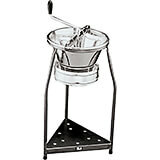 The food mill comes with a stand. Material: Tin.Capacity: 15 Qt. 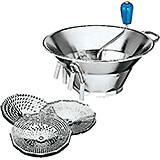 12.25" X 9.75" X 9.75"
Stainless Steel Food Mill, 3 Cutting Plates, 7.88"
7.88" X 7.88" X 3"
This 7-7/8" diameter food mill is designed for small quantities and fits onto pans smaller than 8 5/8" in diameter. 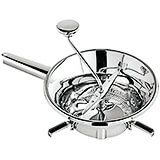 It is made of stainless-steel and comes with three cutting plates. The 7-7/8" food mill output is approximately 1 pound per minute. Stainless Steel Food Mill, 3 Cutting Plates, 9.5"
9.5" X 9.5" X 3.5"
This 9-1/2" diameter food mill is designed for small quantities and fits onto pans smaller than 8 5/8" in diameter. 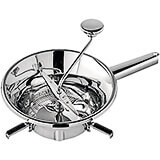 It is made of stainless-steel and comes with three cutting plates. The 9-1/2" food mill output is approximately 1.5 pounds per minute. 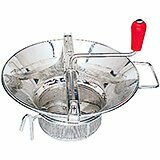 Stainless Steel Food Mill, 7.83"
Stainless Steel Food Mill, 9.5"
Stainless Steel Red Fruit Mill, 7.87"
7.875" X 2" X 7.875"
The Paderno World Cuisine 7 7/8" red fruit mill is constructed of heavy duty stainless steel. 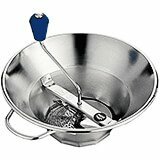 This tool is mostly used to make fruit coulis from berries. The delicate pressure is ideal for soft berries and the fine mesh of the strainer is small enough to retain the minute seeds of the fruit. Stainless Steel, No. 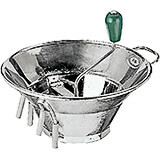 3 Food Mill, 12.25"
Stainless Steel, No. 5 Food Mill, 14.25"
Tinplate No. 5 Food Mill, 14.25"